The 2nd installment in my visiting a record store posts. While I would like to get out to record stores more often than I do, frankly I just do way more mailorder these days. So many labels have exclusive versions of their records only available directly from them, and as much as I like supporting the record stores, I also like to support bands and labels as directly as possible. In an ideal world I'd split my time 50/50, but times have changed since I was young. Anyway, Vintage Vinyl is a store I am very familiar with. I've been coming here since the mid 90's. It was one of those stores that commanded a special trip since it was about an hour away from where I lived at the time. By far the biggest store in the area, plus they had some pretty smart buyers, so you'd always find something unexpected in the racks. It's a pretty good mix of vinyl & CDs. Old stuff, punk stuff, indie stuff and from what I gather a pretty impressive metal section, though that's not really my bag. Big enough to cover all genres, but smart enough to stock good records in every section. For the past 4 years, Vintage Vinyl has been my Record Store Day stop. They get more stock than anyone in the area and every year I manage to get just about everything I need there. 2012 was more of the same. The Record Store Day 2012 releases were pretty underwhelming this year, so for the 1st time in 3 years, I didn't line up early in the morning before the store opened. I wandered in around 11:30 in the morning and only had to wait in line for about 10 minutes. Went up to the counter and sure enough, they had 2 of the 3 records I wanted. Picked up the Little Richard LP and the Otis Redding/Aretha Franklin split 7" (both will have their own posts in the next couple of days). After that I dug around for a bit, but didn't come across anything else that was worth picking up that day. I did, however, take a fascinating picture of the CD section inside. At least on this day, there was no one there; everyone wanted vinyl! 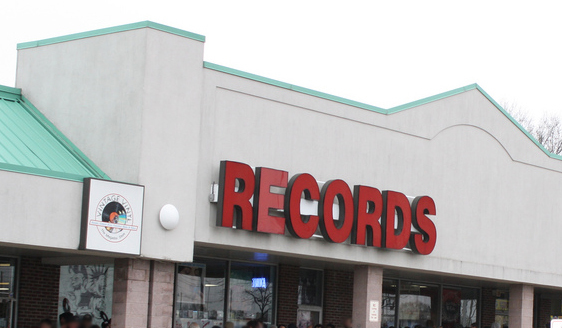 This wasn't the only store I stopped at on Record Store Day, but it was the one I went to explicitly for RSD releases. I also went to another old time favorite, but I'll post about that next week so I have a few days to post about records. Is this Vintage Vinyl in St. Louis, MO? I did a Google search for them, and there are apparently several shops by that name.